My 2018 word of the year: Light. I've been tossing a few different words back and forth, seeing what sticks. 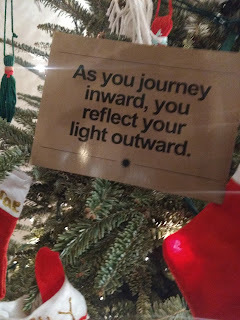 Then I walk into my yoga studio for my first yoga class of 2018 and see the quote picture above: “As you journey inward, you reflect your light outward.” This was the word. Earlier today I Googled the definition of light just to humor myself, but I was instead reminded of the versatility and power of its meaning. In 2018, I will focus on receiving light and being light to myself and those around me. I will let Light be my guide in the darkness and do my best to be a soft, bright spot for others. I will seek to understand and make things visible. More known. Less hiding. I will soak up warmth and hope and extend its natural byproducts of love and gratitude. I will shine no matter my environment- all while illuminating and honoring the best in you. I will live with a cheerful, light-heart no matter the circumstances and when I fail at that, I will give myself grace and reignite joy through faith. For His yoke is easy and His burden light. I will practice letting go and pack lightly, shedding the unnecessary weight. For in the light I can see all the options and trust I'm on the right path. Light reveals the spaces we can fill and in 2018, I'll make expanding into them common practice, growing my heart and mind. Have you set a goal, intention, word, or phrase for 2018? If not, take a moment and think about how you want to feel at the end of the year. Then, work backward. Wishing you love and light in 2018!